Heliguy had the chance to meet with their long-time customer, Andrew Bryson, on a shoot in Druridge Bay Country Park, Northumberland. Andrew is a photographer and videographer based in the North East of England who has had the opportunity to shoot in some fantastic locations including Alnwick Gardens, Bamburgh Castle and at the North Sea Tall Ships Regatta in Blyth. We spoke with Andrew about his career as a photographer, the benefits of using a UAV and advice on for potential future drone users. How long have you been a photographer and how long have you been using drones as part of your photography? I’ve been a photographer for a little over seven years now. I fell into photography after buying a camera for my honeymoon and loved taking photos. I’m into my third year of using drones as part of my photography. Which aircraft do you use and what’s your favourite thing about them? I have three aircraft that I use in my photography and videography. I use a DJI Inspire 1, an Inspire 1 Pro, and a Phantom 2. I’d say my favourite is probably the Inspire 1 Pro as I’m able to capture all the shots I need in the best quality. What’s your favourite location you’ve used your drone to shoot with? It would be hard to pick just one as my favourite location. Two come to mind for different reasons. 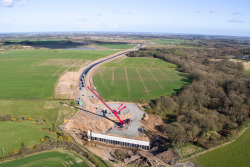 I shot the creation of the Morpeth Bypass as part of their progress reports. It was fascinating to see the site grow from a grass field into the road it is today, going through all the stages of its construction. I’ve also been able to shoot at The Alnwick Garden a few times for their website and as part of LOVE Northumberland. I love this location as it’s such a peaceful and tranquil place. Why do you use Heliguy for your drone services? I initially went through Heliguy for my training on one of their first courses in 2015 as they were local to me and easy to get to. I chose to keep going to Heliguy after my training as they’re really friendly and always make you feel welcome. You can call, email or pop in with any technical questions or for any orders. If they don’t have what you need, they’ll order it in for you quickly. How do you think using drones benefits you as a photographer? I totally fell in love with the unique angles you get from using drones for your photos and videos. 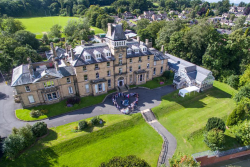 For example, if you’re taking photos at a wedding, you can take pictures from a height and include buildings rather use the building to take photos from. The perspectives are much more distinctive and can make the picture more special for my customers. Do you have a ‘dream’ location you’d like to shoot in? I would love to shoot all over the world but I’d be amazing to go to Hawaii and film surfers coming in on the big waves. Have you got any advice for someone wanting to get into drone photography? Make sure you research into each drone before you buy it and check it’s capable of doing everything you need it for. Always follow the CAA regulations and make sure you avoid all no-fly zone. I’d recommend you take a course through Heliguy, even if you’re not intending on using your drone commercially. It will help you make sure you fly the drone carefully and safely. If you’re interested in finding out more about Andrew’s story, take a look at our Insider post and see his website here. Keep checking back to Heliguy’s Insider Blog for more insights from industry professionals, regulatory information and, of course, the latest news from the drone industry. Heliguy are a CAA approved NQE who offer nationwide training courses. Their course guides pilots through the process of obtaining a PfCO (Permission for Commercial Operation) from the CAA. What’s Include in Heliguy’s Training? Three Day Ground School – The theoretical section of the course that gives students the understanding of equipment used, safe aircraft operations and a variety of aviation knowledge. A theory exam is completed at the end of this section. Operations Manual – The OSC (Operating Safety Case) details the operational procedures you need to follow as well as information pertinent to the business. We will guide and mentor students throughout the completion of their manual. 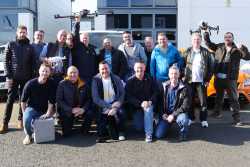 Drone Flight Test – This is the practical section of the course where student’s skills are assessed in control of the aircraft, testing in real-world scenarios and completing the required checks and notifications for a commercial operation. At Heliguy, we pride ourselves on providing the best training to become a commercial operator. Our company ethos is to always keep our clients as the focus of our business. 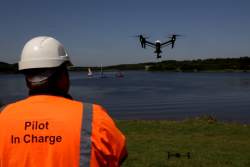 Our trainees range from creatives looking to use their drones for photography and filming to engineers using aircraft for inspection and surveying. We also have strong ties with public sector organisations. We have perfected each section of our syllabus to cover all the required sections for the PfCO, and much more. These have all been broken down into easily digestible subject areas that are communicated in plain English. Heliguy’s teaching technique is proactively updated following each individual training group to ensure all feedback is put into practice. At the beginning of the Ground School, you will be given Heliguy’s Training Handbook, packed with information about your training. You’ll also be given a copy of a flight test guide. These documents are for your ongoing reference and development. If you need any further assistance, our instructors will be available for any questions, the Sales Team are available for any new products and the Technical Team are available for troubleshooting, custom builds and repairs, all by phone, email or even face to face. In addition to the above benefits, our syllabus includes additional areas that will make you a better pilot. A free of charge Night Permission document can be included within your training if requested. This usually would come at an additional cost but is included when training with Heliguy. We realise people learn at different speeds and in different ways. Therefore, if you’re unsuccessful in your theory or practical exam, we will let you resit as required without charging any additional fee. This aims to relieve the pressures of exams, increasing our first-time pass rate. We guarantee that no hidden fees will be added at any time and you won’t be subject to any upselling. Our primary concern is to help you become a safe and skilled commercial operator. We can offer 0% interest packages for both training, equipment and service plans. Heliguy are a Tier 1 DJI Distributor and a DJI Authorised Repair Centre. We can help arrange insurance cover with our partner, Coverdrone. Training with us gives you the opportunity to solely rely on one company for all of your UAV needs. Further to Heliguy’s CAA PfCO course, Heliguy offers a free DJI New Pilot Training course, Drone Video Editing Course and can offer closed courses if required. To book your place on our training course, please visit give us a call on 0191 338 6152 or see our website. DJI has released the new DJI XT Pro iOS app, giving Zenmuse XT users, a much quicker and more simple way capture thermal imagery. The app has been given a new, simplified design, with a focus on thermal settings, allowing users to quickly obtain their thermal data. DJI and FLIR launched the Zenmuse XT thermal camera in December 2015, a product that quickly became the staple aerial thermal imaging camera for firefighters, farmers, inspectors and more. 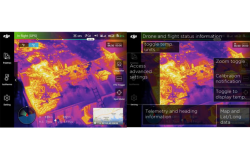 The launch of the DJI XT Pro app aims to help users obtain thermal data in a fast and effective way. View near real-time images through your DJI, Zenmuse XT equipped drone – The DJI XT Pro app will allow users to gain automated data from their Zenmuse XT equipped aircraft. Obtain on-screen temperature estimates – The XT Pro app will quickly allow users to receive temperature estimates on the centre of their screens. With radiometric models, users can select anywhere on-screen to view estimated temperatures. Switch colour palettes to best visualise thermal data – The XT Pro app gives users 12 colour pallets, ranging from White Hot to Fusion, all with false-colour rules. This provides quick visual imagery for the thermal data. Set isotherm controls to quickly see what’s important during your flight – Users can set isotherm controls to identify the minimum and maximum temperature parameters. This allows users to quickly identify temperatures outside their desired ranges. The DJI XT Pro app is a key tool for farmers, inspectors, firefighters and more. Electrical inspections – Users can work quickly, even in close proximity to power lines and other electrical systems, when using the XT Pro app. Its isotherm controls and colour pallets help users quickly identify overheating issues and more. Photovoltaic panel inspections – Users can quickly identify underperforming panels and overheating elements in order to complete maintenance. 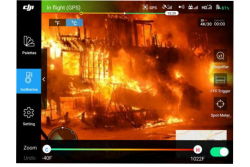 Public safety – The XT Pro app to be used to assess growth and how a fire is spreading, or to locate people in emergency situations. The XT Pro app can be used on mobile devices running iOS 9.3 or later. It is compatible with iPhone, iPad, and iPod touch. The DJI XT Pro app will work with any Matrice drones (M100, M200 Series and M600) and the Inspire 1. When using the Matrice 200 Series drones, please note that you will be unable to view a visual feed from the FPV camera and/or a secondary camera. The XT Pro app can be used as a companion to other DJI apps. It is compatible with the DJI GO, DJI GO 4, DJI Pilot and DJI GS Pro.